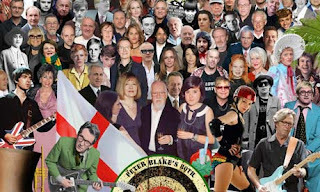 British pop artist Sir Peter Blake has taken inspiration from his most famous artwork – the Beatles' Sgt Pepper's Lonely Hearts Club album cover – to celebrate the British cultural figures he most admires as he marks his 80th birthday. Twiggy, Amy Winehouse, Grayson Perry, JK Rowling and even Monty Python's emblematic foot all feature in a reworked version of the 1967 cover created for his birthday celebrations. Blake, often called the godfather of the British pop art scene, said: "I've chosen people I admire, great people and some who are dear friends. "I had a very long list of people who I wanted to go in but couldn't fit everyone in – I think that shows how strong British culture and its legacy of the last six decades is."